Prime Minister Narendra Modi Friday said India is on the way to becoming the fifth largest economy in the world and the government is taking reform measures on a "daily basis" to further improve investment climate in the country. 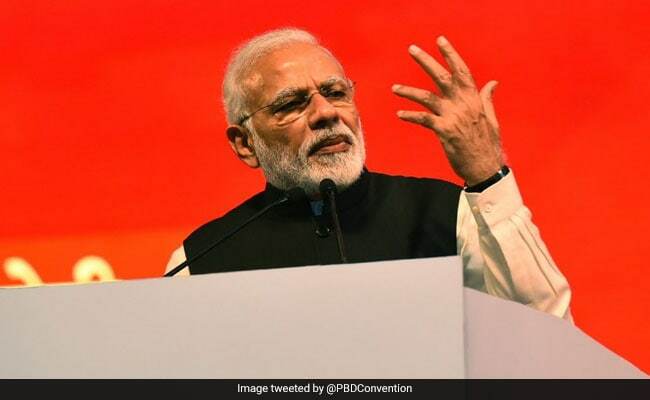 Speaking at the India-South Africa Business Summit, he said India is the world's fastest-growing major economy and the government is committed to building a ''New India'' with next generation infrastructure. The prime minister listed out some of the government flagship initiatives like boosting domestic manufacturing through Make in India and digitising the economy through Digital India. "We are on our way to becoming the fifth largest economy globally...We are one of the top FDI destinations listed by UNCTAD. But, we are not satisfied. On a daily basis, we are making necessary changes and reforms in important sectors of the economy," he said. PM Modi also informed the local and South African businesses that India has jumped to the 77th position in the latest edition of World Bank's Ease of Doing Business Report, which is an improvement of 65 places in the last four years. "We are committed to building a ''New India'' with next generation infrastructure and with emphasis on speed, skill and scale," he said. Talking about bilateral economic relations between the countries, PM Modi said trade between India and South Africa is on the upswing and has crossed the $10 billion mark in 2017-18. "However, there is great potential still. I call upon all Indian and South African government agencies, investment promotion organisations as well as business leaders of both countries to work pro-actively to realise the true potential," he said. India's investment into South Africa is constantly growing and this has approached $10 billion, creating over 20,000 jobs locally. "As a brotherly nation, India will be happy to share its experience in policy reforms and setting up ground level agencies. We encourage even more investment by Indian companies in South Africa and are confident that more South African companies will also enter the Indian market," he added. The prime minister assured that the ''New India'' would welcome the South African businesses to look at all available opportunities in areas such as food, agro processing, deep mining, defence, insurance and infrastructure. "Likewise, India could also partner with South Africa in startups, healthcare and pharma, biotech, IT and IT enabled sectors," PM Modi added. Further, the prime minister said gems and jewellery sector holds huge potential for enhancing collaboration between the countries. "Both countries could explore avenues for direct procurement of diamond. It will ensure economies of scale, and also reduce the cost for both buyers and sellers," he said adding South Africa could also join hands with India in the new and renewable energy sector through the International Solar Alliance. Simplification of the existing visa regime for businessmen and tourists, and direct connectivity would further ease business and people-to-people exchanges, he added. Speaking at the summit, organised by CII, South African President Cyril Ramaphosa said that huge opportunities exist for businesses of both countries to increase cooperation in areas such as agriculture, ICT, aerospace and energy. He said over 150 Indian companies including Tata, Cipla and Mahindra have presence in India. The $1.6 billion investment by Vedanata Resources in mining minerals has triggered a new wave of industrial and economic development in South Africa. "Untapped opportunities still remain in sectors such as agri, agro processing, auto, pharma, aero space, defence industries, infrastructure, energy, ICT, mining, and creative industries," he said. The president said that a number of South African companies have shown interest to invest in India. There are 29 South African companies engaged in different businesses in India and "we wish to double this number in the coming years", he added. On bilateral trade relations between the two nations, Vikramjit Singh Sahney, consul general of South Africa, said that immense scope is available in areas like deep mining, diamond, food processing, and seed development bank. "There should be a direct air connectivity between Delhi and Johannesburg to increase movement of people," he added.